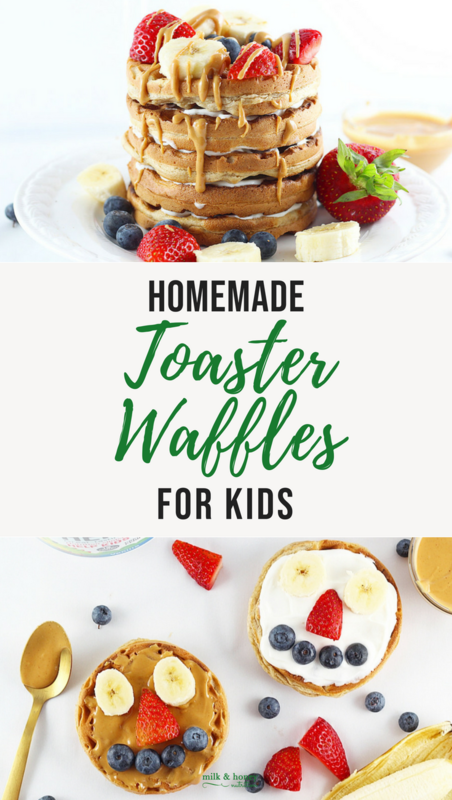 This recipe for Homemade Toaster Waffles for growing kids was sponsored by Healthy Height. All ideas and thoughts are my own. Fortunately, our food culture here in the States has turned around a bit since we were all kids and we all are a little bit more aware of what is in the food we eat and how it's made. AND, even better, food manufacturers have wised up and started to offer much better options in their product lines. We know that a sugar-laden breakfast isn't going to do our kids much good at school (or whatever other activity they have) that day. In fact, without adequate nutrition in the morning, research has shown kids have poorer performance in school (academically), aren't able to focus well, and may exhibit behavior issues in the classroom. Not to mention, if your child is already on the lower end of the growth charts (for height or weight or both), an inadequate breakfast won't help there either. My 4-year-old caught in the act sneaking a waffle! Anyways, fat also plays a role in blood sugar stabilization and satiety... that's basically just fancy speak for the fact that it can help stabilize mood and potential mood swings, and keeps them full and satisfied for longer. Fiber- Fiber also helps to keep us fuller for longer and can potentially prevent any blood sugar spikes that may result in mood swings or an inability to concentrate in the classroom. It's also great for gut health and helping our gut microbiota (aka, all that good bacteria in our GI tract) stay healthy and keep our immune system strong. Protein- Protein, very similar to fat, keeps us (and our kids) fuller for longer and also helps aid in brain growth. Even more, it's essential for muscle, tissue, and bone growth, and contributes to a healthy immune system. If your child is on the lower end of the growth charts, or you feel like they struggle to eat traditional protein sources, incorporating a protein powder created specifically for kids that contains key ingredients to support child growth, like Healthy Height, is a good idea. Top your homemade toaster waffles with unsweetened peanut butter or whole milk yogurt and use some fresh produce to make fun faces! First, they taste AMAZING! They're a bit of a spin off from my Pina Colada Almond Butter Pancakes if you remember those? But these have more protein thanks to Healthy Height Vanilla Shake Mix (though you could use the chocolate if you want). Meaning one waffle will last your child a little bit longer in their belly, keeping them fuller and satisfied for longer. I also recommend topping them with some nut or seed butter for extra fat as well. Preheat a small waffle iron like this one, or a large skillet over medium heat. Combine all of the dry ingredients in one bowl and lightly stir to combine. In a separate bowl, combine the wet ingredients and whisk thoroughly to combine. The nut butter is thick, so you will need to stir it very well or you can use a mixer. Next, add the dry ingredients to the wet ingredients and whisk to combine. Let the batter sit for 5-7 minutes before cooking. Using an ice cream scoop, scoop batter onto the heated waffle iron or skillet (for pancakes). For waffles: Cook according to waffle iron instructions and to desired doneness. For pancakes: Cook for 4-5 minutes, flip, and then cook for an additional 2-3 minutes. To freeze: Set waffles (or pancakes) out to cool on a wire rack. Once completely cooled to room temperature, stack the waffles, layering parchment paper in between each of the waffles so they don't stick together. Store in a plastic freezer-safe ziplock in the freezer. In the morning: Grab 1-2 waffles, pop them in the toaster and cook to desired crispiness!